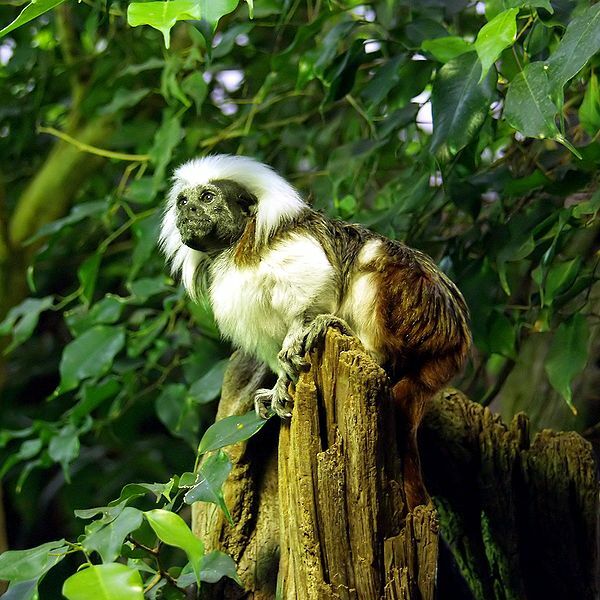 Also known as the Pinche Tamarin, the Cottontop Tamarin is a small monkey from South America. It is so light, that this little creature weighs a mere 500 grams! It lives around the edges of tropical rainforests as well as secondary forests. This little creature weighs only 500 grams! 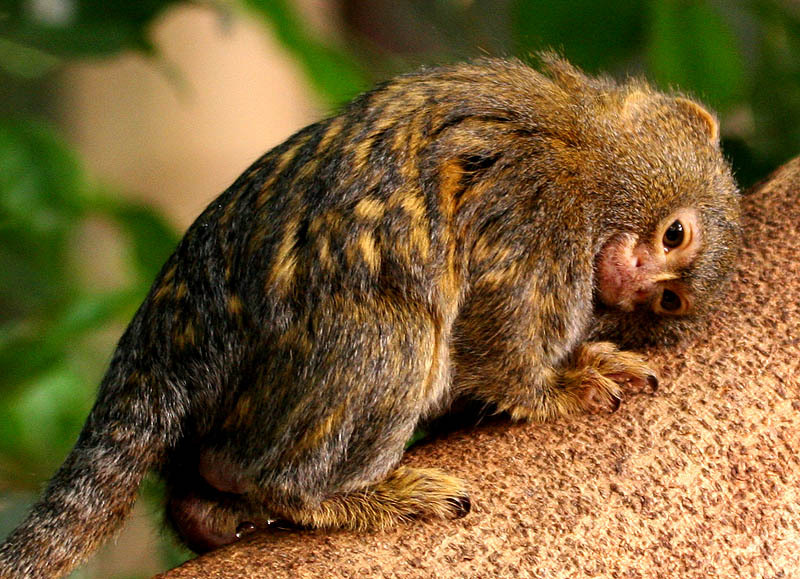 This species of tamarins are about the same size as a squirrel, and have a long saggital chest. It also has white hairs from its forehead to its nape that it flows over the shoulders, hence the name, ‘cotton-top’. It has a brown back, and its legs, arms, and underparts are white-yellow. Its inner thighs and rump are reddish-orange. Although it has a ‘cotton top’, this species is considered to be one of the bare-faced tamarins as it lacks facial hair. Its lower canine teeth are actually longer than its incisors, so it looks as if it has small tusks. 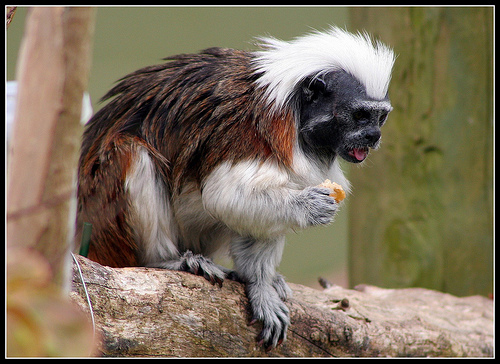 The cottontop tamarin is socialises with other animals, such as the red-faced spider monkey. It has a repertoire of 38 different sounds which is unusually sophisticated for these animals. They can mimic bird whistles, soft chirping, high pitched trilling, and staccato calls. Other than this, its repertoire also includes grammatical rules and is able to express all sorts of emotions such as dismay, playfulness, warnings, calls to young, and curiosity with its vocal abilities. When the cottontop tamarin is excited, it will sing by moving its tongue across the lips. This cute litle creature also has a ‘threat’ face. It makes this face by lowering its forehead until it forms a bulge which almost covers its eyes, its lips are pushed forward, and its head and neck crests are formed. Although it may sound meek, this seems to do the trick as no other form of body language is used as a threat. Unlike many animals, the cotton top tamarin survives better in captivity than in the wild. In captivity, its lifespan can be up to 25 years but in the wild, it is only about 13 to 16 years. This species is deemed as critically endangered, as it has a population of about 6000, 2000 of which are adults. It is critically endangered because of humans clearing the forests, being captured as pets, or being captured for scientific research. Although they are now fortunately protected as a species by internatinoal law and numerous cottontop tamarins are still in captivity, they are still critically endangered in the wild.